Acorns for investing or a high interest savings account, which is better? 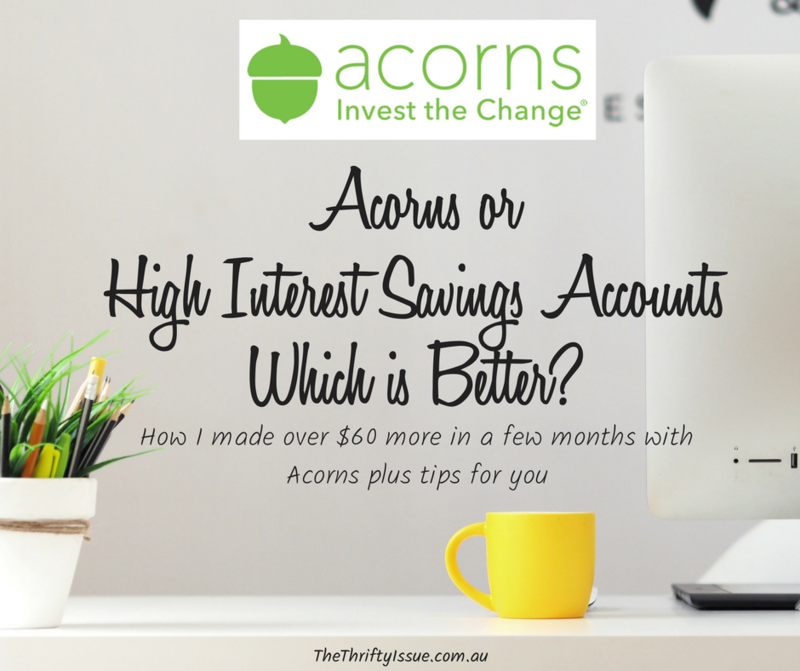 Acorns vs high-interest savings account – which is better for your money? Firstly, I am not a financial advisor. This post will outline a test I did with my own money and the results of my Acorns (now called Raiz) vs high-interest savings accounts experiment, along with some tips to help you decide which is the best option for you. Always get professional financial advice to ensure you are doing what is best for you money when it comes to investments though. Disclosure, we use affiliate links on our site for products and services we personally use to help run the site. Find the full disclosure here. What is Acorns? What is a high-interest savings account? Acorns is an investment platform. You can join and add whatever amount you want then set up recurring investments e.g. $5 a week to be deposited plus add an account to have rounded up whenever you spend money. The money in Acorns is invested in shares and you decide if you invest conservatively, aggressively or somewhere in between. As with any investing, there are risks, though they are smaller with Acorns than investing yourself if you don’t know what you’re doing. Share prices go up and down more than interest on bank accounts which is where the value of what you invest can increase, along with getting dividends from the shares. You can join Acorns here and get a $2.50 bonus to get started. High-interest savings accounts are exactly that, a bank account with the highest interest you can get at the time. Nothing is invested elsewhere and the risk is lower. What you deposit is saved and interest accrued then added to your account. How did I do the comparison? Starting with $20 then investing $20 a week for 3 months meant I invested $280 of my own money. I then let it sit for 2 months, but had it set so any dividends would be reinvested. Currently, it is worth $349.87 (that is after taking out the monthly fee Acorns charge). So the increase in value plus dividends is worth $69.87. With my high-interest savings account the interest was 3%. In the same 3 months, then letting it sit, I earnt $1 interest. Even with bonus interest offers around, you’d still only make around $1. Did Acorns or my savings account return more? In a nutshell, I made more with Acorns, $67.87 more. However, Acorns is investing in shares, whereas a high-interest savings account has fewer risks and is the bank paying you interest while you let them use your money. They are different services and great for different purposes. This makes it look like a no-brainer, right? I made significantly more money with Acorns than I did on the high-interest savings account, so all money should go there, right? Wrong! Acorns is investing in shares and the share market can tank, taking your savings with it when you need it. If you are saving specifically for something such as a new car, braces for the kids or a house deposit, it is generally advisable to put that money into a high-interest savings account as you will need it in the near future. Investing in shares is something I love, but it’s not a short-term strategy. While I only did a few months comparison between the two, I have a higher risk tolerance than most. I am ok watching that money go up and down. If it was my house deposit and I suddenly saw if drop I think I would freak out. That said, there have been dips, but it recovered and then increased each time for me and statistically, the share market has outperformed the property market. High-interest savings accounts are for saving money, Acorns is for investing. Acorns is not the best way to invest in shares, but it can be a great way to build the habit and have it automated. How do I do Acorns and my savings? I have $2,000 in a high-interest savings account as my mini emergency fund and avoid touching it. Usually, if an ’emergency’ comes up, I have a look to see how I can make the money I need quickly instead of dipping into the savings. Next, I have an account for other things I am saving for e.g. court costs, holidays. Comparing interest rates regularly to ensure I get the highest interest means I can save this money without stressing. Lastly, I invest small amounts into Acorns (plus I have other investments, but we are only talking about Acorns and my savings accounts). A regular amount goes in each week, dividends are reinvested and I check my net worth each month to see how I am tracking. The Acorns App is on my phone so I look at it each day and like seeing what’s happening with it. Once it reaches $1,500 I invest in larger portions of shares myself. This is not technically the best approach (you might be better off saving the money in a high-interest savings account and investing directly), however, in terms of changing my habits and ensuring I am investing more, this method worked for me. How I do things isn’t necessarily the best way for you to manage your finances. I cannot stress this enough! If you think you can’t afford a financial advisor, you definitely need one. Every successful person I know has had an advisor from well before they could afford it. The professional advice meant they were able to budget better, set up their finances well, learn more and save more. As a result, as they aged, their financial position drastically improved. Everyone’s financial situation is different. Don’t be taking the advice of Joe Blow down the road who is up to his eyeballs in debt, has no financial background and is on the edge of bankruptcy. Do you take advice on how to fix the plumbing in your home from a mechanic? No, you get a plumber because a plumber is the professional for that job. Take the advice of people who are in the position you want to be in, who have the education and experience to assist you. I highly recommend a financial advisor is they can show you the best way to manage your money and save on tax as well as helping you plan for your future so you can retire comfortably. Lastly, check out this post with 4 Aussies in the top 1% about how they manage their money. All of them had financial advisors early. What is it you want from your life and your money? A good financial advisor will go over all of this with you. If you want to put off seeing one (or have had a bad experience), I understand. Sit down and work out the life you want then set goals to make it happen. Do you want to own a house? Then set a goal for a specific amount to use as a house deposit and cover fees for buying. Do you want to retire at 50? Then you need a plan for it. Work out your cost of living, how you can pay off the house, what you want to invest in and how you will support yourself in retirement. To do this, there are some great books such as The Barefoot Investor or The Total Money Makeover which have steps to get your finances sorted. It is extremely general advice though, not personalised. Also, books such as The Automatic Millionaire, The Millionaire Nextdoor, The One Minute Millionaire and The Richest Man In Babylon will help. Buy them from The Book Depository (the cheapest option I have found) or borrow them from the library. My preference is to buy books because when I was younger my parents had these sort of books on their bookshelves which meant I was reading them as a teenager and it helped me learn. If you have kids, you need these books in your home. Check out 12 books everyone must read and more about them here. I invest aggressively as it typically provides higher returns, however, it also has higher risks. You need to determine how comfortable you are with risk. One of the great things about Acorns is you can invest small amounts, play around with the risk levels and see how you feel. If higher risk and the dips in the market make you nervous, it might be better for you to not invest in shares. 4.) What will you save in and how will you invest? If you took the time in step 2 to define your goals, you probably have some things you are saving for and an idea of what you want for retirement. When it comes to savings, set a high-interest savings account and start saving a set amount each week. You can use online calculators to work out how much you need to save to achieve goals in a certain time or how long it will take to save your goal amount based on how much you can afford at this time. Know what the fees are and take the time to learn more. Acorns is a great way to get started in the share market with a low risk and to develop the habit of saving/investing but it’s not the best option. If you learn more and get professional advice, you will do better. That said, for a start, it is great. Because Acorns has a monthly fee, if you are investing minimal amounts, you can end up paying more for the convenience. It becomes more worthwhile with larger amounts, but personally, I feel the larger amounts are better invested with professional advice or after doing your own research. With their fees, for accounts under $5,000, the fee is $1.25 a month which is direct debited from your nominated bank account on the last trading day of the month. For accounts over $5,000, it is 0.275% of your portfolio value and they usually sell stocks or parts of stocks to cover the fee instead of direct debiting. In my opinion, Acorns can be a great way to automate your investing, change your habits and get you thinking differently. It can help start you on the right path and helps you do it yourself. Eventually, you would be best getting a financial advisor, learning more about the sharemarket and sorting out your finances accordingly. If you want to join Acorns, get your $2.50 bonus here. I think it would be good to have a conversation about it. I read most of the books you recommended and have a question. I have super account and mortgage offset account. Do you think that investing in super or simply keeping money on the offset account would be better investment than Acorns? Why I am asking: I think I would pay less fees if invest money via super and have less risk, no fees, guaranteed interest and liquidity if I can keep them on super. I have itching hands to invest via Acorns, but my logical thinking says me otherwise. I also understood from the books, than logical thinking does not always help when it touches money or financial habits, so I would really appreciate your help with that! Hi Lana, thanks for the comment. For specific advice like that you need to speak to your own personal financial advisor. Thanks.